Please see our rental agreement for ACTUAL CANCELLATION POLICY and refunds. The Beachcomber bungalow is a tropical island style lodging... off on a dirt road, not on the main hwy, less than a minute walk to the beach. It is ideal for honeymooners, but also perfect for a family. If your looking for a quiet, private and peaceful place to stay on your vacation, this may be the place for you. The Beachcomber Bungalow is an open and airy comfortable beach house, with wood and tile floors, high open beam ceilings and skylights in almost every room. 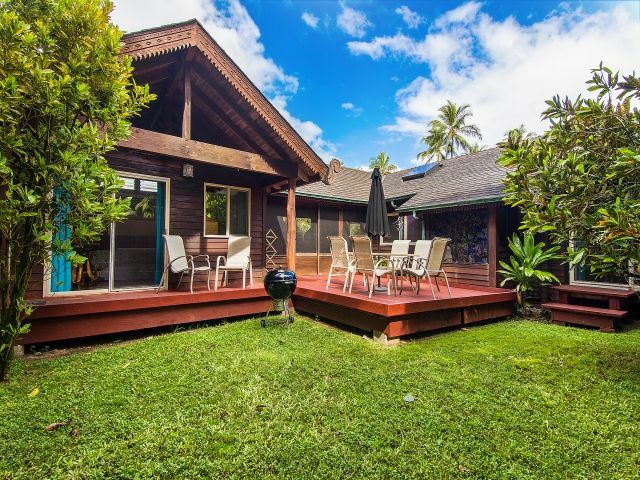 It is tucked away in Haena, off the main road in a safe and quiet area, just steps from the beach. You will be lulled to sleep at night by the sound of the ocean. The white sandy beach out front has epic snorkeling and swimming (seasonal). You can walk on the beach and pick shells, all the way to the end of the road if you want to. It is less than a mile from Tunnels beach. It is located just west of Kepuhi Point in Haena on the north shore of Kauai. You are a ten minute drive from the sleepy town of Hanalei, where you will find an abundance of restaurants and stores to fill all your shopping needs. Just three minutes in the other direction leads you along some of the most scenic, snorkeling beaches to the end of the road, the gateway to the spectacular Na Pali Coast and hiking trail. This beach house can accommodate people that need wheelchair accessIbility. This house in on the ground, not up on stilts. There is a ramp to the front door, and a roll in shower in both the bathrooms. The whole house is not completely wheelchair accessible, the other bedrooms have a few steps up into them. But there is a nice open layout throughout the house on wood or tile floors for easy getting around whether your in a wheelchair or not. There is a king bed in the master bedroom and a queen-size bed in the other 2 bedrooms. This house has been lovingly cared for and has beautiful hand made Hawaiian hardwood kitchen counters. The kitchen has a open and easy design for cooking meals and has all the amenities to accommodate cooking for a family. There is a nice dining area off the kitchen where you can eat your meals. There are woven bamboo panels and polished black bamboo accents on many of the walls in the house. The address is 7183 Alealea Rd. Please note that this house is near the ocean and is considered the tsunami evacuation zone. Both bathrooms have a roll in shower that is accessible for people that need a shower wheelchair. (shower chair not provided) There is an outdoor shower in the front yard. This area is considered "deep country". Please drive slowly and watch for children, pigs, horses, chickens and people on bikes. All sheets, towels and beach towels are provided. Plenty of room to park on the property. All cars need to be on the property, not on the road. very comfortable couches. Great gathering area. Large kitchen with plenty of counter space and everything you need to cook for your family. Great dining area that is just off the kitchen. Large round teak table with plenty of room for everyone to spread out. a few CD available, bring your favorites with you. Not ADA but most of the house can accommodate someone in a wheelchair. We can give information for private chef, massages, spa or babysitter.